Our Summer Sale with up to 25% OFF! Plus for launch weekend only, get up to an extra 10% OFF on top of sale prices! T&C's: Extra discounts are only valid during the launch weekend 29/06/2018 to 01/07/2018. 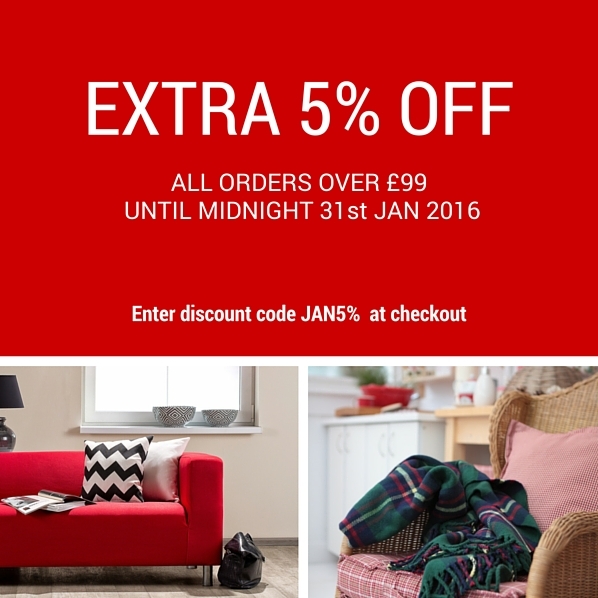 This includes an extra 10% off individual pieces of furniture and an extra 5% off bundle offers. All offers are subject to status and cannot be used in conjunction with any offers, such as clearance products. For 3 days only, we're offering a preview of our Winter Sale! For this weekend only, we're turning our sale prices on (up to 30% off) plus up to an extra 10% off too! That's 10% off all sale prices (individual items) and 5% off all bundles/offers for 3 days!. To get up to an extra 10% off enter the code 'PREVIEW' at checkout. For anyone lucky to live close to the store we've got Prosecco and mince pies on offer plus live music from swing singers to local choirs to get the festive season started. T&C's: Discounts run from 08/12/17 and ends midnight 10/12/17. Valid in store and online. Extra 10% discount valid on individual items, extra 5% discount valid on bundles/offers only. GLAMOROUS - Extra 25% Off Summer Clearance! There's already up to 75% off items in the summer clearance, and now Glamorous is offering an EXTRA 25% off those prices for a limited time only. Simply enter code GET25 at checkout before midnight Monday 19th September to claim this offer. With categories within the sale including £5 Tops, and £5 Dresses (see URLs below), the time is now to get a bargain! OKA are pleased to announce they are offering an extra 20% off their Summer Sale. Save an extra 20% on a huge selection of furniture and accessories, including a wide range of our favourite pieces and best-sellers. To qualify for the extra discount enter the code HURRY16 at the checkout. This is available for a limited time only from Thursday 28th July until midnight Sunday 31st July. Discount only available on Sale product category on OKA.com. This offer and cannot be used in conjunction with any other offer/discount. Discount cannot be applied retrospectively. Hope you are well. We are excited to announce a new incentive - Double commission (5%) on all New Year skiing holidays. To boost your commission, simply promote our fantastic New Year offer - 2 free days skiing plus an extra £200 off per couple. The offer is available until 31st May 2016. Your commission will initially track at the standard rate of 2.5% but will be amended to 5% within 7 days of booking. Join the biggest party on the slopes. Enjoy fantastic apres, fantastic atmosphere and our special Celebration Menu. Take advantage of 9 nights' stay for the price of 7 in Austria and France, and 8 nights' stay for the price of 7 in Italy. Prices include return flights, transfers and 7 nights in one of our exclusive catered chalets or chalet hotels. ^The extra commission applies to all online bookings for departure on 30th December 2016. Your commission will initially track at the standard rate of 2.5% but will be doubled on qualifying bookings. Please note the commission increase cannot be applied retrospectively and only applies to qualifying bookings placed between 27th April and 31st May 2016. Get ready for another special promotion of Crocs starting next monday. Crocs is offering a 10% extra discount on the whole assortiment. Moreover, this discount is also valid on all sale articles. The perfect moment to provide all your visitors with the most amazing shoes of Crocs. This promotion is valid from October 25th until October 28th! Extra 15% Off Sale at TOPMAN - Today Only!